- You choose level of walk on the second day. (first day, we all walk up to hotel. Details below. - You choose, more snowshoeing, or sledding (slitta) too. Day 1: leave cars in the parking right after the car-train loading area, near Pension Hotel Furka in Realp. Then we walk up the snow-covered Furkapass road, which is closed for the winter, to Hotel Tiefenbach. Difficulty: considered WT1 (scale Protected content , mainly because it is walking on a road, not too steep, and snow is packed/hard. However, we have an elevation difference of 570m over 5.6 km. - Main program: Up to Albert Heim Hütte, in a beautiful mountain landscape, then to Schafberg and back to hotel. Difficulty: Medium. WT2. Protected content uphill, 520m downhill. 7km. 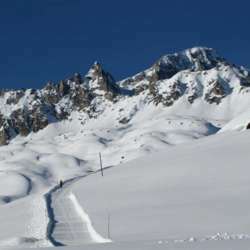 - Easy option: Either walk up with us as far as you like, then go back to hotel, or walk further up the snow-covered Furkapass road as far as you wish (to the pass it's 5.2 km, and 330m uphill) enjoy the scenery, and return to hotel. Once back in hotel, we will rent sleds (slitta) and just ride alllll the way down to Realp (5.6 km, 570m downhill). We return sleds in Realp. Hotel: check website, decide your desired level of comfort, and reserve directly. Important: In reservation put down "Internations Lugano Group". Important for dining room seating and sleeping arrangements, especially for dormitory option. Please be sure to also read cancellation policy. Slitta: Depending on model and availability Protected content CHF. Or Fat Trotti 29.00 CHF/with helmet. Food: Hotel offers HP. Make sure to have enough food for 2 lunches.